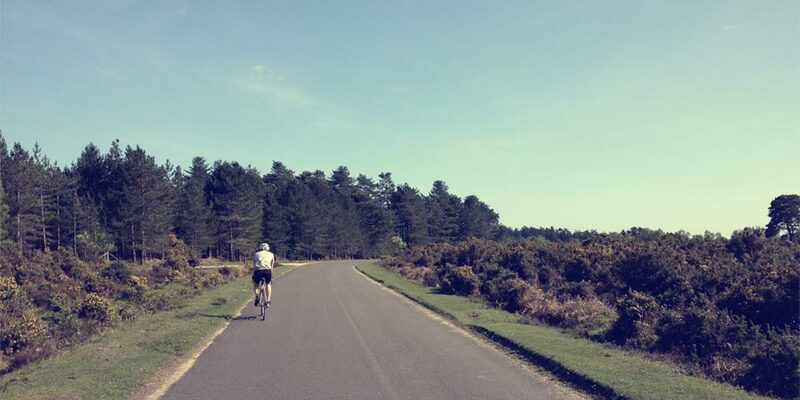 Named after the Red Shoot Inn, which is located on the tree lined climb (or descent – depending on which way you want to do this), Red Shoot will show off the best the New Forest has to offer: climbs, descents and wide open vistas. 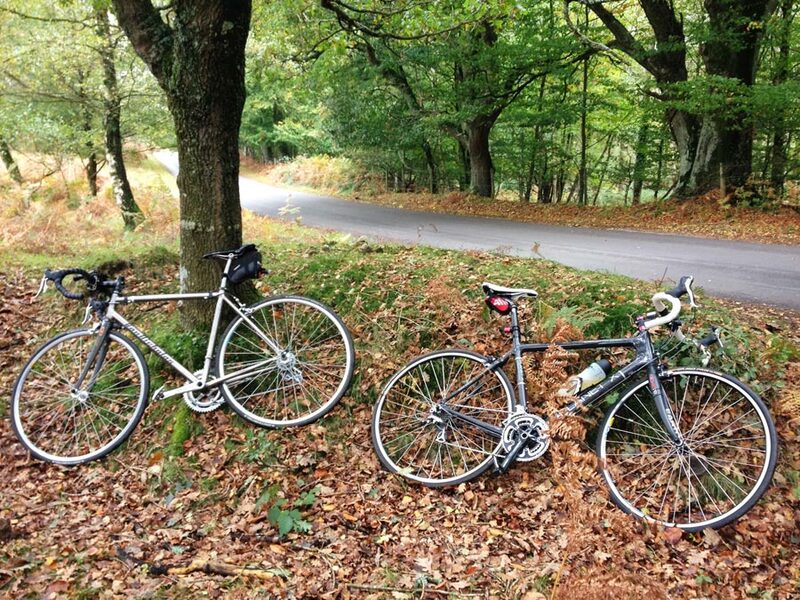 This is a great route for an afternoon ride – especially if it’s sunny! Rhinefield Arboretum – home to giant Redwoods. Suggested start / finish points are Brockenhurst, Ringwood and Hordle. All these locations have parking and somewhere to stock up on supplies. If you ride the route in a clockwise direction, you will climb up through the tree lined road past the Red Shoot pub until you come out into the wide open plain. As with any of our routes, you can start where you like, but for our descriptions here, we always start and finish in Hordle, heading in a clockwise direction. Turn left onto the A35 and then take the next right onto Lyndhurst Road. Winding down and then up through the trees take the next right onto Forest Road. You are now cycling on one of the many WW2 airfields that used to be a feature of the forest. RAF Holmsley South was a major WW2 airfield that was home to USAAF B-26’s, parts of the runway can easily be seen as you cycle along this road. Head straight across at the cross roads onto Braggers Lane and follow it round to the left and then into a nice little downhill section. At the crossroads, take a right and follow the road for a few miles towards Ringwood. At the green triangle take a right and follow this road to the t-junction at the end. Then, you’ll want to go straight across (slight dog-leg) onto Crow Lane. Stay on Crow Lane until you reach another ‘green triangle’ opposite the Elm Tree Inn. Head right here onto Hightown Road. Take the first left onto Nouale Lane, which takes you up towards the A31. At the end take a left, up the ramp to the roundabout, where you’ll go right over the A31 and in towards Poulner. At the mini roundabout turn right onto Gorley Road. Stay on Gorley Road, heading out of the built up area and back into the Forest. You will cross a (probably dry) ford and bear left onto Highwood Lane. This is the location of another former WW2 airfield, RAF Ibsley, USAAF Station 347. Most of the old airbase has gone, much of it under the waters of the gravel pits on your left, but the control tower, a bunker and some hardstanding still remains. Following the road round, you will come out into the open, with a ford on your left and a small road straight ahead, going up into some trees. This is the start of the climb up to Red Shoot. 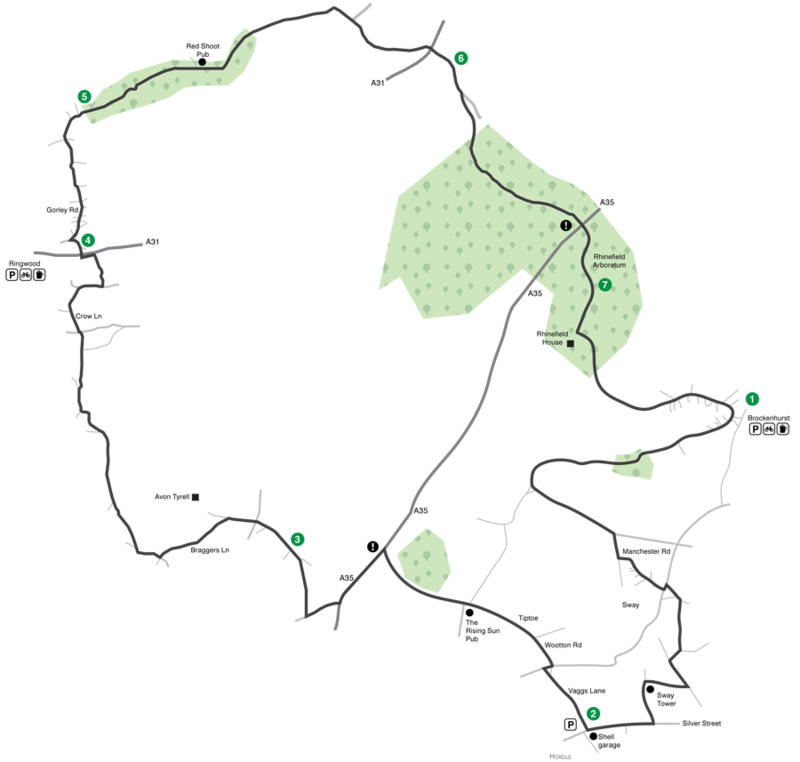 This is one of the best climbs in the New Forest, it has it all, tree lined for part of it, open for the other sections. Passing the Red Shoot Inn, keep climbing up until you reach the open moorland where the road will narrow so take extra care with on coming traffic. Further on, the road will head back downhill, a nice fast one, taking you back under the A31 and then a short climb back up towards Bolderwood. At the top of the climb you will pass the Canadian War Memorial on your left. Take the next right onto the Arboretum Drive. This is a lovely downhill section through the trees, visibility is fairly good ahead, but keep a sharp lookout for traffic. At the junction, head across the A35 onto Ornamental Drive. If you’re riding this early morning, then keep a look out for deer as they are fairly common here. Winding through the Giant Redwoods, past Rhinefield House and eventually into the open plain, heading towards Brockenhurst. Keep on the same road as you come into Brockenhurst, following it round to the right, taking you out of the town and onto a gently uphill climb. Keep on Burley road, until you reach the left hand junction. Take this left, along the straight, down the dip, up the other side, then take the right. Just after crossing the cattle grid, take a left onto Manchester Road, follow this right to the end. At the junction, turn left, then next right. Take the second left onto Coombe Lane. At the junction at the bottom of the hill, take a left and then after a few hundred metres a right onto Flexford Lane. This road will take you close by Sway Tower, it’s also a hotly contested Strava segment, if you’re feeling up to it. At the end turn left and follow the road to the junction where you will need to turn right, taking you back to Hordle.